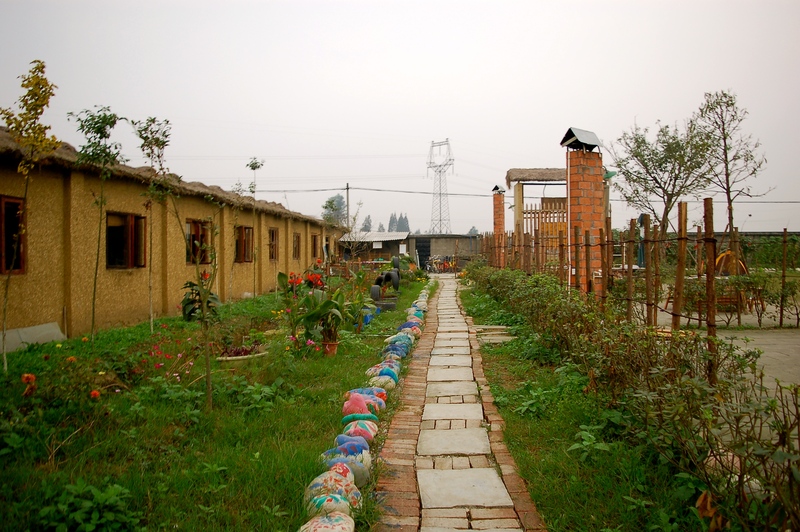 Urban-to-Rural Migration: From Business Marketing in Beijing, to Fish Farming in Sichuan? Rapid urbanization, rural-to-urban migration, social stratification and the environmental consequences of poorly regulated economic growth and resource degradation – including the pollution of air, soil, and water, loss of arable land to development, deforestation, and desertification – are all central concerns facing China, and therefore the world’s, sustainable development. So, take nearly every one of those issues, think of it’s opposite, and that is the story of the Chen family. 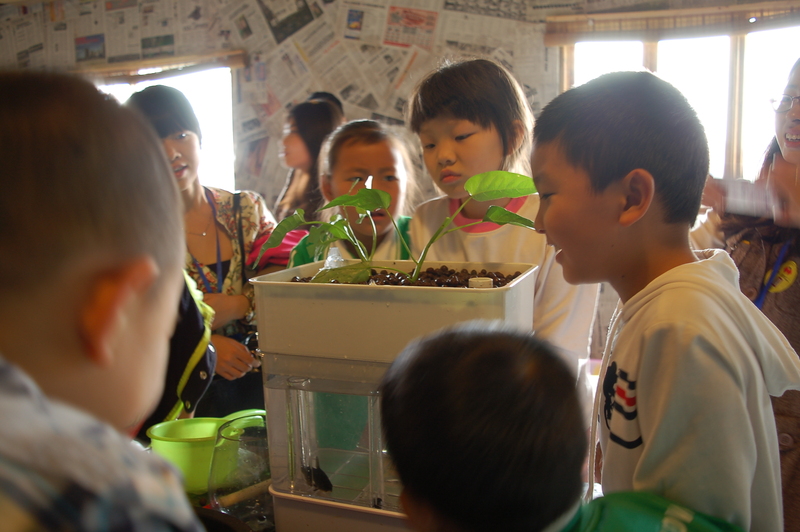 Mr. and Mrs. Chen run an organic aquaponics farm about an hour outside Chengdu, the capital of Sichuan province. 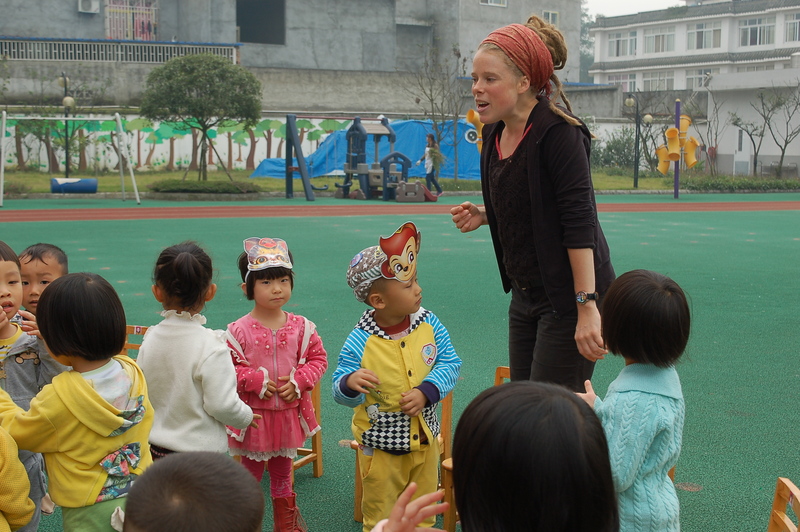 After ten years of living and working in Beijing – Mrs. Chen worked in marketing and Mr. Chen was in the air force – last year they moved to Liaoxing village to ‘escape the pressures and pollution of the big city’, and start a dual farm/restaurant that opens it doors to the local community and groups of school children eager to learn about their growing business and life on the farm. 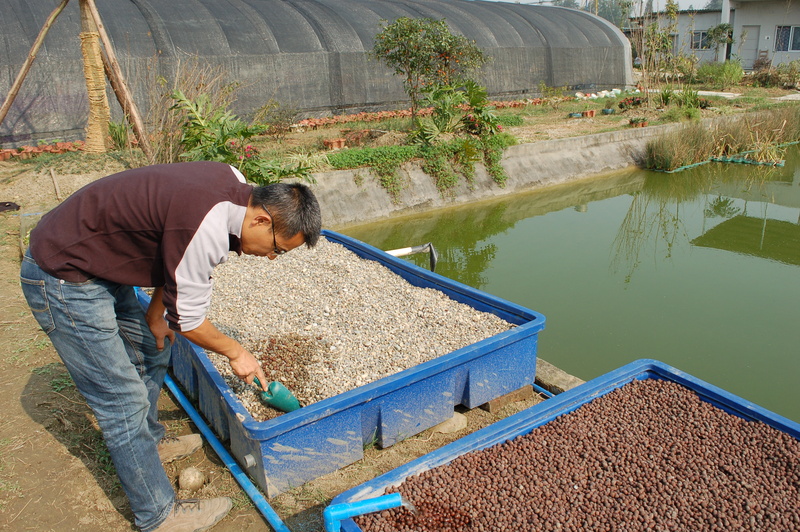 Mr. Chen, scooping the gravel bed for the filtration system beside their aquaculture pond. In addition to aquaponics and vegetables, they raise goats, chickens and rabbits. Six full-time employees help on the farm, and there was also another volunteer from Hungary, Adrienne, who is an MA student with a focus in soils and waste management. 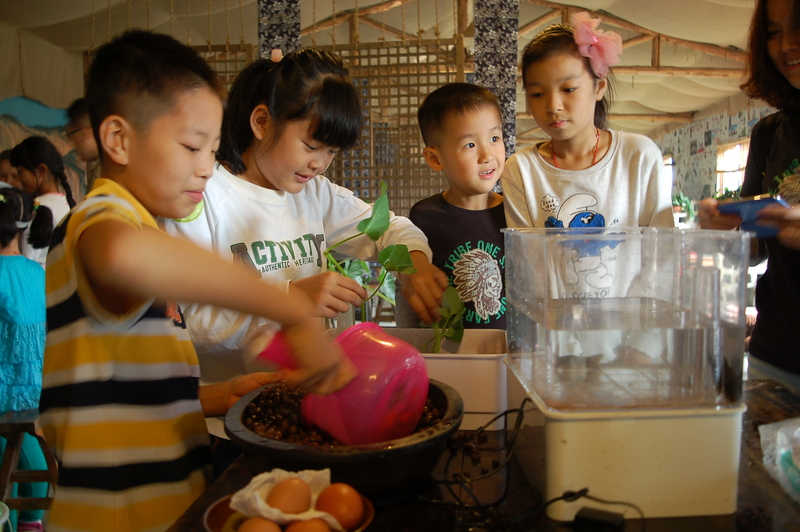 For the groups of school children that often visit, one of the many activities Mr. Chen arranges is an aquaponics demonstration, where students learn about the symbiosis between fish and plants: combining the hydroponic system where plants are grown with the aquaculture system where fish are raised prevents fish poop from accumulating in the water and increasing the toxicity. The fish-poop water is fed into the hydroponic system where the by-product is broken down and absorbed by the plants as nutrients, before the water is circulated back into the fish tank. After playing the video, Mr. Chen then asks the students what the movie is about. Sometimes they get it, and sometimes they don’t. But one day this one kid, no older than eight, totally nailed it, saying: in the city your heart can feel sick, but on a farm what you do is basic to who you are, it is basic to a community and it is good for your heart. 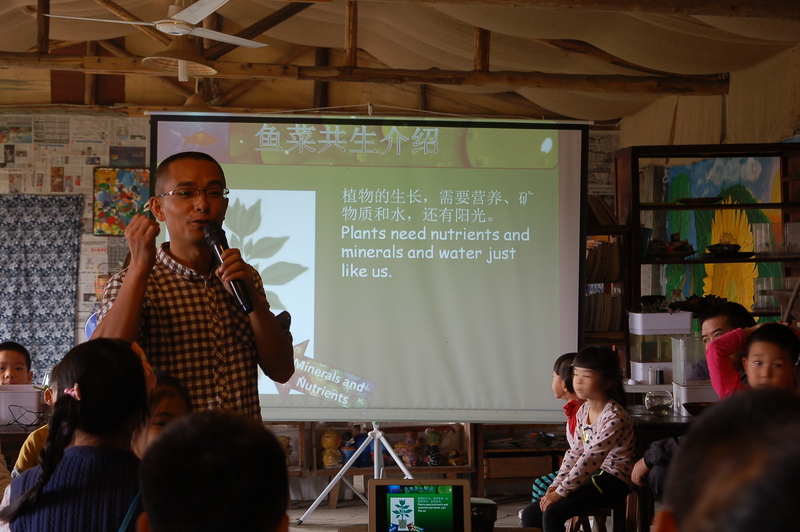 One day, Mr. Chen’s friend, Philip (his English name), who runs a local kindergarten, visited the farm in preparation for a field trip he was planning for his students later that week. After we were introduced, Philip invited Adrienne and I to visit his school the following day, meet the teachers, and teach a few English lessons to the kids. Philip, in the doorway of the school. On our drive over in the morning, Philip explained that around five years ago the central government set a goal of getting 97 percent of children 3-6 years old into kindergarten schools. 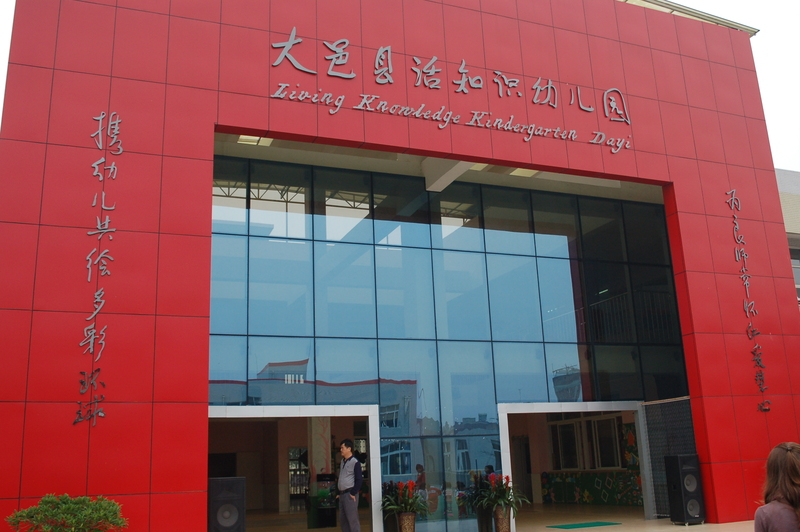 Millions and millions of yuan were invested in the project, and new schools with modern facilities sprung up in small towns and villages all across the country. However, once the infrastructure was in place there was no real plan for staffing, teacher training, or a clear curriculum – at this point the towns and villages were pretty much on their own. They spend all this money, he explained, but they don’t pay attention to the actual implementation. Usually this is the [responsibility of the] director of the kindergarten. There are not guidelines for the teachers. It is too hard for them. …and then they bring their ID card over to this red machine where their attendance is recorded electronically. In rural areas starved for resources and qualified teachers, the task of transforming shells of schools into holistic, engaging learning environments is nearly sisyphean. Yet it is difficult to imagine anyone more qualified than Philip to tackle the challenge. After receiving his master’s degree in ‘Education for National Development’ in Hong Kong, he went on to get a doctorate in the US and spent a number of years working for the UN, helping Vietnamese refugees enter and navigate the Hong Kong education system. 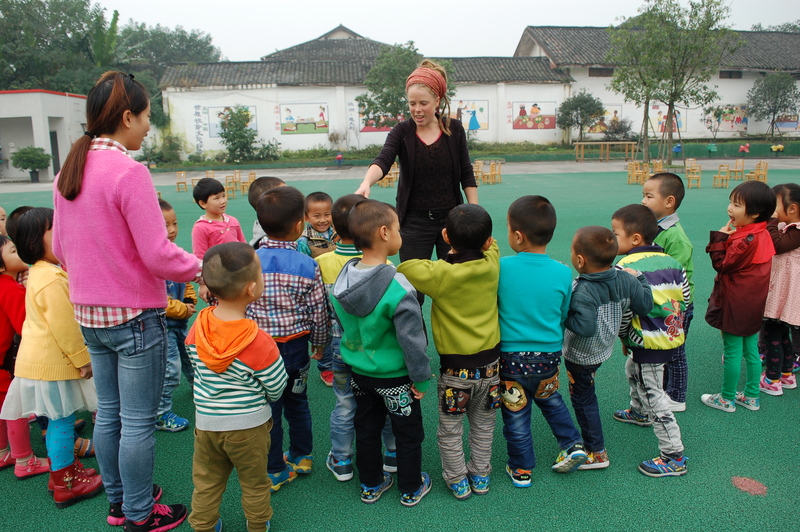 In 2005, he gave up his job as a professor in Educational Philosophy at a Hong Kong university to come to mainland China and work with the Education Bureau in Gansu province to help build the capacity of an entire county of kindergarten schools – 200 in total. He said that was when they realized there was no way to help all of the schools at the same time; they had to move step by step, first to identify one school to be a model, help them to change first, and then help the others to follow. 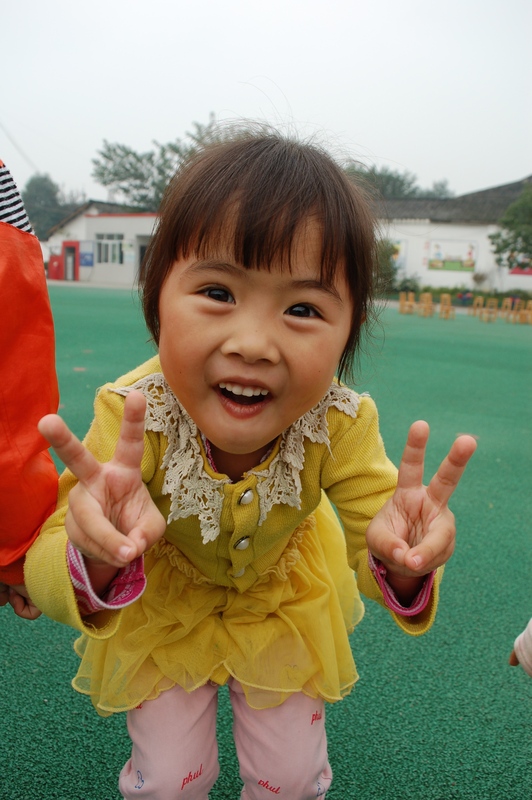 Philip stayed in Gansu for three years, but he moved to Sichuan in 2008 after the earthquake hit, and has been at this school ever since. When he first arrived there were less than a handful of teachers for two hundreds students. Today he oversees eighteen teachers, and 80 percent he hired from the local village. …and ‘duck, duck, goose’ for the tiniest squirts. As dedicated as Philip is to the students and their families, the core focus of his passion and energy is invested in the teachers and the training he provides to help them break free from the traditional emphasis on rote memorization, and encourage them to be creative and interactive with lessons that range from games and story-telling to poetry and ‘theater therapy’. The teachers are the key to the sustainability of his efforts. That afternoon he arranged for the three of us to chat freely with a group of teachers, to help them practice their English and exchange ideas like cultural differences to personal values and future goals. At one point, he asked each of the teachers, who were all no older than 23, to imagine themselves at 60 years old and describe how they would like their life to be. This entry was posted in Urban-to-Rural Migration and tagged Back-to-the-Land Movement, cooperatives, fish farming, organic farming, rural China, rural land-use, Sichuan, social enterprise, wwoof china. Bookmark the permalink. 1 Response to Urban-to-Rural Migration: From Business Marketing in Beijing, to Fish Farming in Sichuan? 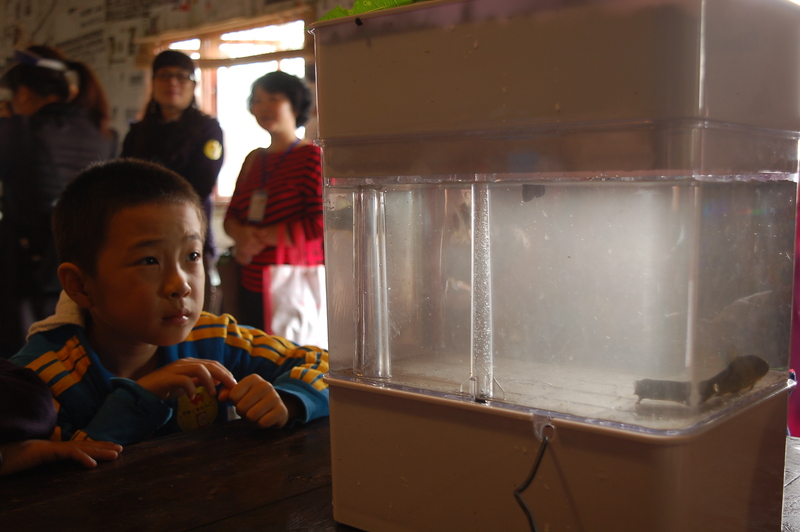 I’m interested on visiting the aquaponics farm in Chengdu. My question is: how are the sleeping and bathroom accommodations?